This pore-diminishing night complex eliminates large pores, while ensuring your skin's firmness and brightness at all hours. Shrink & tighten+ works its magic in the night to stimulate collagen production, to make sure your pores will always be out of sight. Its 10% L-ascorbic acid and cell regeneration nutrients firms your skin, brightens your complexion, leaving your looking flawless and absolutely healthy once again. shrink and tighten+ was added to your shopping cart. 1. Use shrink and tighten+ daily, every night after cleanser. 2. Pump 2-3 pea-sized drops of shrink and tighten + onto your palm. 3. Apply over your face and neck using circular motions until fully absorbed. 4. Keep the product in a cool place or in the fridge and we recommend to use the it within 6 months after opening. 5. The product lasts between 2 and 3 months until completely used. i use this at night for almost a month and what i can say is that now in the morning my face looks fresher and make up goes on my face better. it does have like citrus & medicated oil smell and have slight hot stinging sensation but i would say this product does have subtle result and will need continous use. This is in oil form. After applying, I feel a burning sensation on my face. I think that possibly, maybe my face is too dry. I try the shrink and tighten+ again after immerse me on next day and no more burning sensation. Strong smell, a bit irritated. I think it consider as a good product, quick to absorb. Smell a bit strong. A bit irritated, because i got a very sensitive skin. Easy to absorb and no oily. 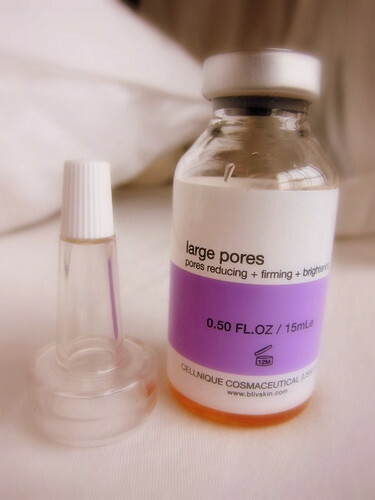 Shrink my large pore a bit, so far, will keep using. I like this serum very much as after i apply at the night and morning the oily from the whiteheads is melt out. I can see pores is smaller after wash face. But for larges it takes times i guess. not that fast yet to see the effect. Supper Efficient and fast delivery. I try the first bottle and it really help reducing my larger pores. My face turn fine and bright. I love this product so much!!! Plan to get the second bottle. Super fast delivery and great product!! My second bottle!! Just started using this product, it is oil type serum & will fully absorp after a minute. Feel warm when apply it.Used this at night & shrink and tighten on morning. i love this for make my pores become smaller, it also make my skin brighter. A very good product! Value for money. Love this serum, after using it every night my pores do shrink but not completely closed that's impossible. But it makes my pores smaller. This serum is working as what they claim. It really shrink the pores. I love the consistency, it does not make my face oily or sticky. but, I can't the obvious effect after the application of this product. Maybe it need time.. I use this product at night, after my toner, and end my routine with a moisturizer. When I first started using it, I don't quite like it as it make my skin look oily. But after a minute, my skin fully absorb it. I notice my blackheads and whiteheads are finer. 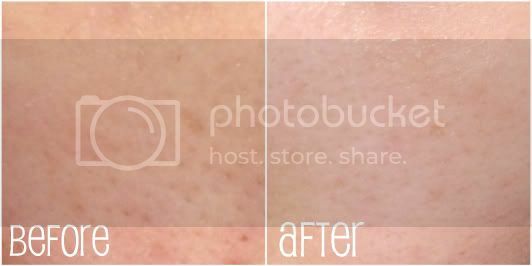 The best result is to use this together with Shrink and Tighten serum (day use). Include both of them in your beauty regime, and you have smoother skin in no time. I use this with off my these heads and it amazing. smaller pores and smoother skin. if i apple it on my neck it removes my neck wrikkle lines almost like one use. The colour will turn more yellowish as i used it, i hope it does not effects the quilty of the product. its quite oily but i think its okie cause i only use it at night. Since I used bliv skincare, my skin is very moisture. My colleagues keep giving compliments on my face cause it is glowing from morning till end of office hours. I used it everyday and before go to bed. My pores also shrinks. I am in love with bliv. I also recommended my sisters to use these too cause when they see the improvement of my face they are eager to try it too! I used Drench Me for facial cleanser. Daytime, I used Refresh me toner, Quench Me gel and Get Off Those Heads. Before bed, for glowing and brightening effect in the morning, Shrink & Tighten+ and Submerge Me for skin booster. Got Me Covered is not produce anymore and I already used it for 2 years cause I managed to bought 2 bottles since last it was sold. It was good too for foundation and sunblock. Thanks bliv! I love this serum, after using it every night my pores do shrink but not completely closed that's impossible. But it makes my pores smaller. Other than that, it also brightens my dark spots and also unclog my pores. This is my 3rd bottle!! I can't find any other serum to replace bliv shrink n tighten+ !!! I have been using this product along with "squeaky clean" and "off with those heads" every single day, non-stop, since November 2014, the results have been amazing. All my life I suffered for acne, one big zit from time to time and blackheads all over my nose and cheeks and forehead, especially during my period. Now, miraculously my skin looks healthy, clean, it even glows, for the first time in my life people actually say "you have nice skin" Please DON'T stop making this products! I bought this at the online counter in China, it is somehow the most oily product of bliv. But it won't cause any breakouts and you can tell the difference after around a week's usage. I was told that there is no product that can actually shrink your pores, it can only cover it for a while. 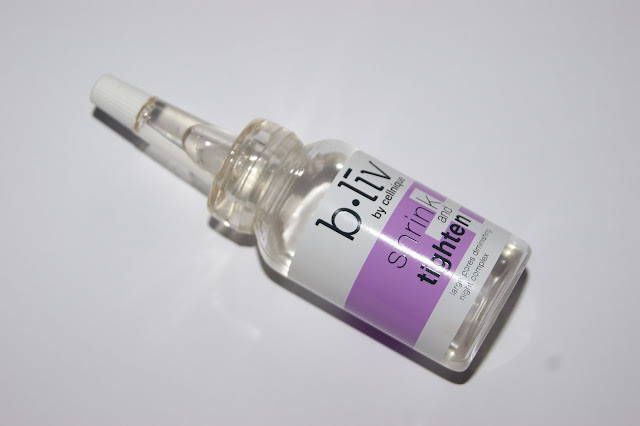 But once I used bliv, I found the product that can actually vanish your pore! I'm a big fan of bliv products! I will change all my skin product into bliv! I use this one wit the off those heads serum together. This one is easy to absorb. But I think the serum works more. Because I can see my nose is now much cleaner than before, the blackheads are almost gone, but the pores are still obvious. But I think this maybe because that it takes a longer time for the pores to become smaller. I will try it for a longer time to see the result, and I believe it will work. This product is recommended in a beauty forum and I bought it and have been using it for one month and half. It really works. Although it appears very oily, it feels very smooth , can be absorbed very quickly and moistens the skin. I obsolutely love it! I used to have serious acne problems around my face for years and I poped it all the time but I never really buy any skin care for shink pores because I am more concern about hydration so when I realise it I found I can't stand for it any more..The bottom is really small, I thought It probably last about a month, but now this is the end of second month and I havn't quite finish it...I really can see the result on my face, especially around my forehead and area near my nose. I tripple check it every day and I can see its actually shink it. Amazing..... But you need to very careful to place it cause if you spill it, it's gone.. This product is quite good, a little bit oily, but just 2-3 drops at a time. I'm use with the OFF WITH THOSE HEADS together, just coated it with a warm feeling, but soon absorbed; The second day wake up you will see very clean pore, also feel narrowed. Will insist on down. I love this product and all BLIV products. They are all quickly effect, quickly absorbed by the skin. I used to have large pores and scars, now my skin remained 50% smoothie. Great stuff. I will buy it again.works good on the pores. I highly recommend this product. Looks very oily, but, quickly absorbed by the skin. I will keep using it with "off with those heads", hopefully one day my pores marks can disappear. Shrink and Tighten+night time treatment After continuous usage for 10 days, I can actually feel that my T-zone and sheer is much smoother than before. In fact, when I looked in the mirror, I’m actually amazed with what it has done!! I use this product with off the black head at night. I've applied for about 2 weeks. I can see some change for my face. The large pores in T zone and nose are smaller, and I can figure that the skin is silk than before. The oil is oily, but it will not lead acne. Love it very much. I bought this product with "off with those heads". This product works like a magic on my face. I have large pores issue for a decade because of the blackheads on my nose and cheeks. Though I tried a lot of products to minimize my pores, from toner to serum, among these, this one is my favorite. After using it for a week , I can see the changes of my pores on my nose and my cheeks. The pores keep shrink a little bit everyday. Now i use it every night after using off with those heads. It is like massage oil, one small drop on each of my cheek and one drop on my nose, then i circle it on my face until it is absorbed. When I wake up the next morning, pores are just magically smaller. I will keep using it with "off with those heads" , hopefully one day my pores can become invisible. I really think that you need to use this product together with the other shrink + tighten serum to see the effects. On the first two nights, my face feels warm with tingling sensation and it is like 'massage oil'. After few second, it was absorbed by the face, and i felt the face is tight. What surprise me is my face is not oily at all on the next morning and also it's still tight and bright. It really give the effect as it promised, realize the pores are smaller as well. This is quite expensive for such a small bottles thing, but if it provides good effect, i will still continue using it. Shrink + Tighten came in a small glass bottle. The liquid in it wasn't full, but i'm sure there were 30ml. This product is oily and it has a bit of honey smell to it. I only used 4 tiny drops to completely cover my face and neck. This product also gave me a tingling sensation at first just like "off with those head", which i love. The next morning, my face felt so smooth. Awesome product fo rmaking me beautiful! After tried the bliv off with those heads product and turns good on me, the next problem on my skin is large pores. I decided to try this serum and bought it online in this website. The package came fast, good delivery :), but when i opened it i found yellow stain on the bottle label and the contents also really really unexpected -.-'..haha...maybe bliv must pack the proper bottle size for 15ml, since i can't measure the liquid, only can tell by the bottle size =P. However, it give warm sensation at first couple seconds and the result on my skin not overnight. After using for few days the result start in my forehead, the pores became reduce there. But not take much effect on my cheek or other big pores (scars). Right now i'm using the Intense Series from Cellnique that sent to me for free, i'll review it after my 1 month application on Cellnique's page. We appreciate your feedback and insights after using our products. Log in or register to submit your reviews now. Please take note that all reviews are genuine and opinions are solely based on customers’ own experiences. b.liv practices zero-tolerance policy on fake reviews.